It's finally dawning on President Barack Obama the grave dangers that have been created for the American Republic by decades of neoconservative dominance of U.S. foreign policy, but his moves in response to this dire threat remain hesitant and indecisive. The only game-saving play open to Obama now -- in response to recent Saudi-backed escalation of Sunni extremism in Syria and Iraq as well the new right-wing racist government in Israel -- may be to forge an alliance with Iran and Russia as a counterforce in the Middle East that could save Syria's relatively secular regime and reverse gains by the Islamic State inside Iraq. That, however, would require Obama finally taking control of his foreign policy and throwing out or at least sidelining many of the neocons and "liberal interventionists" whom he has tolerated and promoted. It's difficult to see how the likes of Assistant Secretary of State for European Affairs Victoria Nuland and Ambassador to the United Nations Samantha Power would fall in line behind the necessary moves to build such a pragmatic alliance. Power has been a top advocate for "regime change" in Syria, wanting to wage an air war against the government of Bashar al-Assad even if destroying his military would risk opening the gates of Damascus to the Islamic State and/or al-Qaeda's Nusra Front. Power has promoted some of the most extreme and dubious propaganda against Assad, such as blaming him for the mysterious sarin gas attack outside Damascus on Aug. 21, 2013. Despite serious doubts that Assad's regime had anything to do with the attack, Power -- along with other "liberal interventionists" and neocons -- pumped for U.S. military retaliation that would have devastated Assad's army, which has been the only significant obstacle to victory by Sunni extremists. Power, a foreign policy adviser to Obama since the 2008 campaign, remains an anti-Assad hardliner. After the August 2013 sarin attack, the neocons thought their dream of ousting the Assads was finally coming true, so they were bitterly disappointed when President Obama cooperated with Russian President Vladimir Putin in finding a way away from war, getting Assad to surrender his chemical weapons arsenal (while still denying any role in the Aug. 21, 2013 attack). Putin and Obama also teamed up to get Iran to the negotiating table regarding its nuclear program, thwarting another neocon hope to "bomb-bomb-bomb Iran" and achieve "regime change" in Tehran, too. After those two untimely interventions for peace, Putin rose to the top of the neocon enemies list. By late 2013 and early 2014, Nuland was encouraging political disruptions in Ukraine and making plans for a "regime change" on Russia's border. In early February 2014, she was overheard handpicking Ukraine's future leaders. 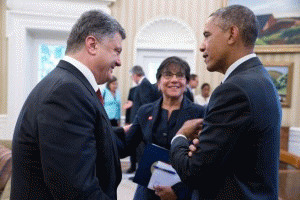 "Yats is the guy," she said about then-opposition figure Arseniy Yatsenyuk. The Kiev coup provoked Putin into supporting the secession of Crimea, an ethnic Russian stronghold and home of Russia's Black Sea port at Sevastopol. Though overwhelmingly popular on the peninsula, Crimea's decision to secede and rejoin Russia was denounced by the mainstream U.S. media as a "Russian invasion," despite the fact that Russian troops were already in Crimea under the Sevastopol basing agreement. However, in the U.S. media, influential neocons and liberal interventionists made sure there was an unrelenting barrage of anti-Russian propaganda to keep the American public in line. Putin was elevated into the top tiers of designated demons and even Obama joined in the Putin-bashing. Meanwhile, in the Middle East, Israel and Saudi Arabia were finding common cause in their mutual hatred of Shiite-ruled Iran and its allies. As part of the Sunni regional war against the Shiites, the Saudis and other Gulf states covertly slipped money and other assistance to al-Qaeda's Nusra Front and the Islamic State in Syria, while Israel developed what amounted to a non-aggression pact with Nusra along the Golan Heights, even launching airstrikes against Lebanese Hezbollah fighters who were helping Assad battle these Sunni extremists.